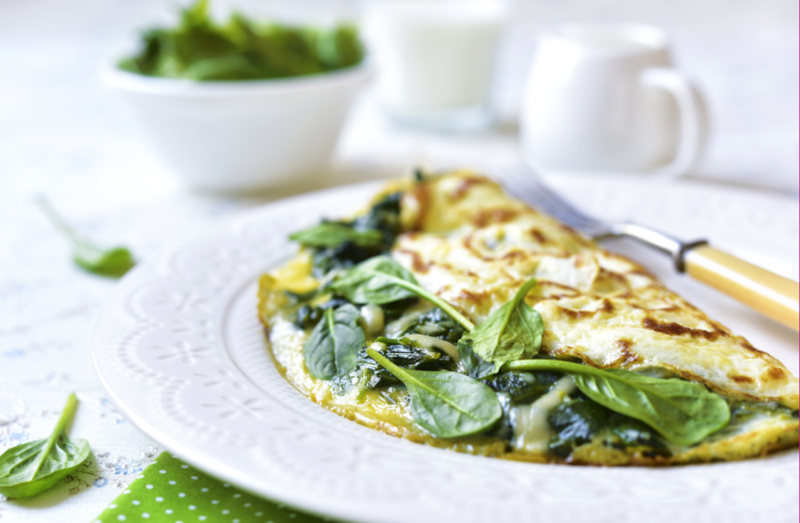 Omelettes are a protein packed breakfast option that also make a terrific lunch, or easy dinner. Wilt the spinach in a lightly oiled pan and fold through the feta to warm. Set aside. Lightly whisk the eggs with milk and a pinch of pepper. In a non-stick frypan melt the butter over a moderate heat while swirling over the surface until it starts to sizzle. Pour in the egg mix and swirl the pan ensuring a thin, round omelette is formed. Briefly cover with a tight fitting lid so the surface egg is almost cooked. Spoon the warmed filling on half the omelette and again cover for about 20 seconds. Remove the lid and sprinkle with pine nuts. Tip the pan towards the serving plate and fold the omelette in half to encase the filling. Slip the omelette onto the plate and serve with any low FODMAP toasted bread. For a nut free option replace pine nuts with toasted sunflower seeds.